Although a significant quantity of Scott Joplin‘s music survives, there is very little recorded history in the form of first hand accounts of the man himself. Instead this book pieces together what is known about the composer, with many aspects of music and society in general from the places where he lived and worked, and thus creates a fascinating picture of the man. Scott Joplin was extremely talented, well-educated, hard-working and generous, yet like most people he was also a complex product of his own personality and life experiences. This book reveals that 3-dimensional view of the man by juxtaposing his life and work with the major events taking place around him. The result gives new insights in what it was to be a struggling black composer carving out a new musical direction at the beginning of the 20th Century. The book charts the main events in the composer’s life. He was born near what is now the border between Arkansas and Texas, both his parents were musical and he learned how to play his mother’s banjo at a young age while she she did the laundry of a local white woman in return for his piano lessons. His musical and improvisational skills caught the attention of a local German music teacher who taught him classical music and instilled a broad appreciation of the arts. He performed in many establishments including the brothels of St. Louis and his compositions focused on instumental ragtime which was starting to gain in popularity. His musical ambitions grew as he toured with a number of groups and started publishing his compositions. Following extended stays in St. Louis and Chicago, he settled for a time in New York where he interacted with many other musicians in Tin Pan Alley. 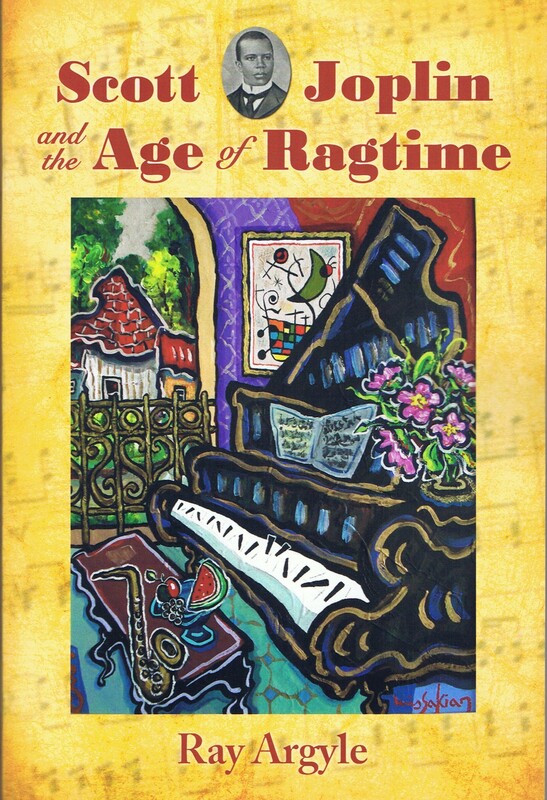 Although we often think of Ragtime Music as consisting only of the piano rags of Joplin and his contemporaries, the book reminds us that “ragtime” was a much broader movement than this. Popular songs of the day were also using syncopated rhythms, and this key aspect of ragtime made its way into many musical forms and had an immeasurable impact on the development of music in the 20th Century. The author Argyle elaborates on this, citing the way that ragtime crept into broadway shows and accompanied the early silent cinema while influencing a succession of events that was to result in many diverse styles of music from Jazz and Swing to Rock and Roll. Indeed we learn a little about the strained relationship between Joplin and songwriter Irvine Berlin who published “Alexander’s Ragtime Band” in 1911. Another key aspect of Joplin’s personality brought out by Argyle is the many ways he supported his friends and family, sending money home on a regular basis including to his father who had left his mother while he was still a boy. He also sent money to his German music teacher in appreciation for his teaching and encouragement. But his generosity wasn’t simply in the financial sense. He in turn taught many others how to write ragtime, and encouraged many budding ragtime composers by co-writing rags with them, including Arthur Marshall and Scott Hayden. It was his education which gave him a head start in the world, and he was convinced that education was key to improving the lives of black Americans. This theme became the plot of his opera “Treemonisha” and the book describes Joplin’s vision for an opera based on Ragtime, and his disillusionment as he struggled to realise this ambition over a number of years. Scott Joplin was a fascinating figure and “Scott Joplin and the Age of Ragtime” is an excellent read, for musicians, historians and the curious. It can be found at these links on Amazon.co.uk and Amazon.com, or direct from the publishers at McFarland Publications.